The Lanihuli house was an impressive Victorian mansion built in 1893 by Hawaii Mission President Matthew Noall and dedicated on October 6, 1894 during the semi-annual mission conference.1 At the time, it was considered the finest residence on the Windward Coast of Oahu, and a visual symbol of the Latter-day Saints’ presence in Hawaii. It was originally built as a single story; a second was added a few years later. 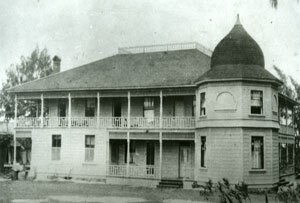 The Lanihuli Home served as the mission headquarters and residence of the mission president until 1919, when the center of mission operations was moved to Honolulu. It then served as lodgings for inter-island Saints while they attended the temple, and also as a residence for missionaries assigned to the Laie Plantation. During World War II, it housed an army medical unit for troops stationed in the area. When the Church College of Hawaii opened in 1955, the Lanihuli Home served as the girls’ dormitory. When the new campus was completed in 1958, it was discovered that time and termites had taken their toll, and the old Lanihuli Home was torn down to make way for expansion of the College.2 Although now only a memory, the Lanihuli Home served as a home away from home for many who passed through beautiful Laie. In 2006, Hawaii Reserves, Inc., Mormon Historic Sites Foundation, Mormon Pacific Historical Society, and the Laie Community Association coordinated efforts to place a marker near the site, telling the history and significance of the Lanihuli Home. 1 R. Lanier Britsch, Unto the Islands of the Sea: A History of the Latter-day Saints in the Pacific, (Salt Lake City: Deseret Book Co., 1986), 158. 2 Eloise Aguiar, “Project revives La’ie’s ‘heart and soul,'” The Honolulu Advertiser, July 27, 2006.